Who among us can deny the satisfying whoosh of ketchup coming clean out of a bottle? You might remember the ketchup video that lit up the Internet a couple years ago: an anonymous hand tipping a glass bottle of ketchup, which slid out with nary a streak of red. It was magic. And the physics of slippery surfaces could be far more revolutionary than a trick for saving a few ounces of condiment. Sticky stuff sticking to surfaces is a fact of life: Plates and utensils get crusted with food and someone has to wash them each and every time. But in a world of super slippery coatings, the very concept of “cleaning” goes away. Startups like SLIPS Technologies and LiquiGlide, the latter of which made the viral ketchup video, are now branching out into the world of industrial applications. Think ketchup is hard to get out? Or barnacles that attach themselves to a ship like, well, barnacles. Or bacteria building up a slimy layer in IV lines. The two companies’ coatings share a basic principle: the liquid-impregnated surface. As weird as that may sound, it comes out of the idea that to make a surface slippery, you want to make it as smooth as possible. “The problem is you can’t take a solid surface and make it perfectly smooth on a molecular level,” says Daniel Behr, CEO of SLIPS Technologies. Instead, these companies coat the jagged surface with a thin layer of liquid, which is smooth. Both companies are creating a suite of liquid-impregnated surfaces tailored to different applications. The exact formulation of the liquid depends on what you’re trying to keep off the surface—whether ketchup or crude oil or the glue barnacles use to stick to ships. The key difference is that SLIPS’s uses more liquid over the surface than LiquiGlide’s. One of SLIPS’s biggest projects right now is combatting the problem of barnacles and mussels—one that actually wastes a huge amount of fuel. When barnacles and mussels take over a ship’s once-smooth hull, they create drag. More drag means more fuel to travel the same distance. 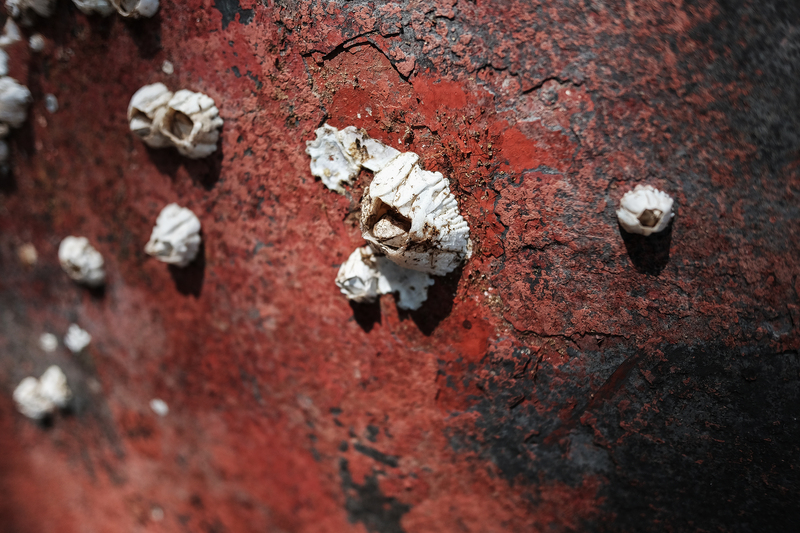 The Harvard team that created SLIPS won a $2.7 million Department of Energy grant and is now monitoring square meter patches of its slippery anti-barnacle paint on ships everywhere from New England to the United Kingdom to the Indian Ocean. Similar coatings could make stents, catheters, and IV lines safer. Bacteria often grow into a film on these devices, only to make trouble when they infect the body. SLIPS vice president Scott Healy said his company is working with four different medical device companies to test their coatings, though he declined to name them or give specifics. And last year, just before LiquiGlide made a splash partnering with Elmer’s for glue bottles, it announced with less fanfare that it was getting into the oil and gas industry. Thick, sticky oil can flow through miles of pipeline before it reaches your house. The company said it was experimenting with coatings for piles and large, stainless steel tanks. Financially, these coatings seem to make sense in places when they would actually save you money, i.e. with an expensive product. “It could be very attractive for high end, high sensitivity applications,” says Ali Erdemir, who works on coatings at Argonne National Laboratories. For example, he speculated, lenses on minimally invasive surgical equipment—or those on surveillance drones and planes flying high in the sky. The joke goes that if you’re a hammer, everything looks like a nail. And it you’re super slippery coating, everything looks like a sticky surface to make no-stick.